No secret here, but I am a HUGE fan of the iPad Pro and the Apple Pencil and what it can can do for a person’s creativity. The suite of art apps available for the iPad is impressive, affordable, and improves all the time. With that in mind, I'm posting this rundown of what I consider to be the top drawing apps available and what they can do for you. There will probably be more than you realize. The standouts are judged on their quality, usability, level of continued support, and price is also a concern. Part of the benefit of going with iOS as your platform is getting away from the expensive subscription model of Adobe, but that decision is largely one of preference and perhaps how deep your pockets are. All these apps will also work on regular iPads, but where they’ll really shine are on the iPad Pro and the new iPad with Apple Pencil support. While these are all Raster-based apps, there is a separate post for Vector apps called, Best Vector Apps for iPad, so don’t worry if they’re missing here. I mean…it’s Procreate…for anyone who has used the app, that’s almost all you need to say. Procreate is game-changing and there couldn’t be a more appropriate use of the phrase than in this instance. I’ve seen comic book artists, graphic designers, and illustrators of all styles making the jump from their Cintiq’s to iPad solely because of this app. In the simplest terms, Procreate is a drawing/painting app that was developed to specifically to be just that and designed solely for the iPad. It is minimalist, easy-to-use, and requires almost no instruction to start creating. It is intuitive as HELL and has a huge, ever-growing following. Improvements and additional features have come quickly down the pipeline for Procreate users and many of the tools digital artists would consider essential in apps such as Photoshop have made their way into Procreate as well. They also appear to be the tide that raises all ships in the mobile art app world. When an excellent new feature appears in Procreate, it’s not long before that feature pops up in many of the other top tier art apps for the iPad. I could write an entire book-length post about all the things Procreate does and does well, but honestly the best way to find out is to download it and start playing with it yourself. At $9.99 for a ONE TIME PRICE, how could you really not give it a try? 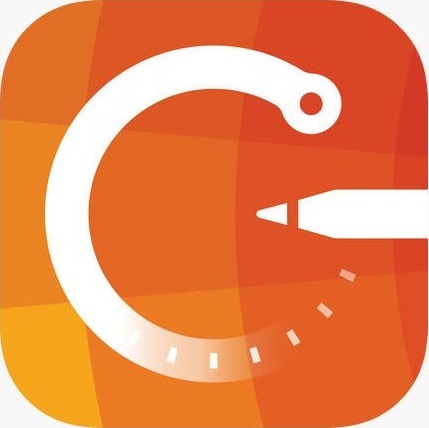 Linea was the first sketching app designed for Apple Pencil. It’s super simple and has just enough of the necessary things you’d want to use in drawing app without the complexity of additional tools designed for creating fully-rendered images. The suite of basic brushes you have to work with are simple, which means you’ll focus more on getting your initial idea down in a visual form than worrying about a finished image. The app really shines as an easy way to visually brainstorm your ideas or just mindlessly sketch without much concern for finished artwork pieces. It is the app that I would say most closely resembles physically tools right out of the box without much tweaking of brushes or settings. There are several default background textures to draw on such as Paper Grain, Butcher’s Paper (brown), Gray Bristol, Black Construction, and my favorite…Blueprint. A couple of white pencil lines on the blueprint background and I feel like some kind of futuristic industrial engineer. It’s just incredibly fun to play with. The iPad version has recently changed name from Linea to Linea Sketch and they’ve just released a version for iPhone called Linea Go. Additionally, you can get Linea Link from the Mac App Store which will allow you to import your Linea sketches into any desktop art app to render the image further should you wish. 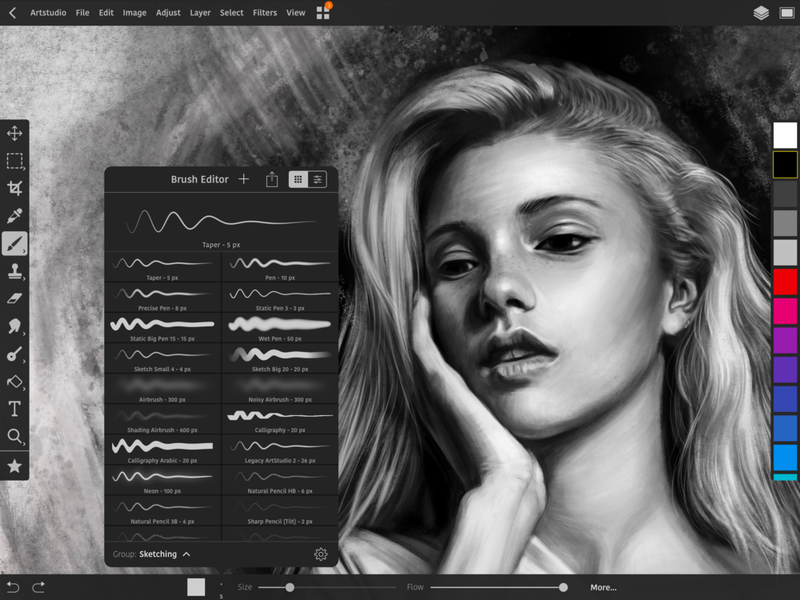 Autodesk Sketchbook, or just “Sketchbook” for regular users, is a powerful entry to the iPad art landscape. The software has been around for a while in the form of two versions; Sketchbook and Sketchbook Pro. “Pro” had a variety of extra features for a yearly subscription price. Well, since the beginning of 2018, Autodesk has made the total suite of features found in the Pro edition, free for everyone! The updated app is now simply, “Autodesk Sketchbook”, the “Pro” having been dropped from the title. Now that we got that bit of background out of the way, let’s get down to brass tacks which sounds like it hurts. Sketchbook is excellent at a variety of artistic uses. It has a very minimalist UI and even the minor toolbars that you see you are able to hide with the touch of one button which gives you a true 100% drawing field that takes up the whole screen. It’s fantastic at sketching (sure hope so) as well working on completed art. It has had useful features such as Symmetry for a long time before Procreate got them. It also has a couple of key features that Procreate still lacks, a basic shape tool and Predictive Stroke. Both are very pleasing to work with on the iPad. In addition, it also includes the Copic Color Library which is absolutely wonderful. Sketchbook excels at creating art AND for more “practical” applications such as industrial design, something very few apps can say. The best part of all? It’s FREE. So there really isn’t any excuse to not give it a test drive. Artstudio Pro looks and functions a lot like if someone had redesigned Adobe Photoshop for the iPad with an increased focus on drawing and simplified the interface. For those who have used Photoshop in the past as their primary art creation software, Artstudio Pro may make for an easy transition to working on an iPad. It’s even fully compatible with Photoshop brushes. 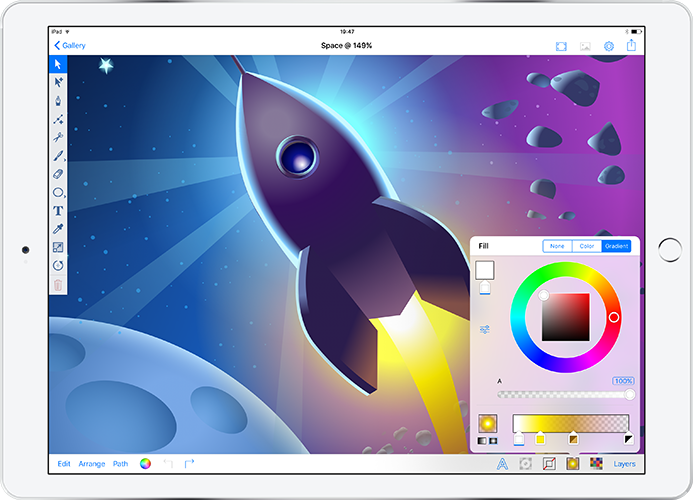 At $11.99, it’s not the cheapest of the top tier art apps for iPad, but it’s only a couple more dollars than most others out there and may make for the easiest transition for those going from Photoshop to the iPad. I’ll admit, I’ve kind of been sleeping on MediBang Paint and forgot it was around. When it came time to dive into again for this blog post, I remembered that there are some genuinely great things about this app worth looking at. It’s a very capable drawing and painting app that is built with creating manga or comic books in mind. MediBang strikes me as a cleaner version of Clip Studio Paint (which I talk about later) as though someone figured out what the issues of the CSP interface was and fixed them. Oh, and then gave you the app for free. The UI of MediBang isn’t perfect though, there are occasionally issues with certain tools just not being intuitive enough to figure out without experimenting with almost every tool. Cloud syncing is done via MediBang after registering for a free account, so I’m not quite sure about the reliability without testing it more extensively, but so far, so good. The app hasn’t seen much in the way of updates over the last year, but I don’t think there’s anything glaring that needs to be fixed, except I would love to see the small ad banner they display on the menu page be removed, blah, and of course the never-ending quest to make the simplest and most intuitive menus out there. It’s a worthwhile addition to your digital art tool set. I love Infinite Painter if nothing else than their spunkiness. They describe the app on their website as “the most advanced painting app on mobile”. You have to admire the confidence. The UI is probably the most minimalist of all the art apps on iPad, it’s very pleasing to look at. The default brushes are all very impressive as well as customizable. You can also create your own brushes from imported images which opens the doors for all kinds of possibilities. Like Procreate, Infinite Painter gives you a choice of Light or Dark mode which I always enjoy. The app is free to download and you’ll get all the extra tools and features for an in-app purchase of $7.99. I like what Infinite Painter has done so far and I’ll be following future developments to see where they go. Sketches by Tayasui is another quality entry to the growing field of simple, but capable art apps for the iPad. 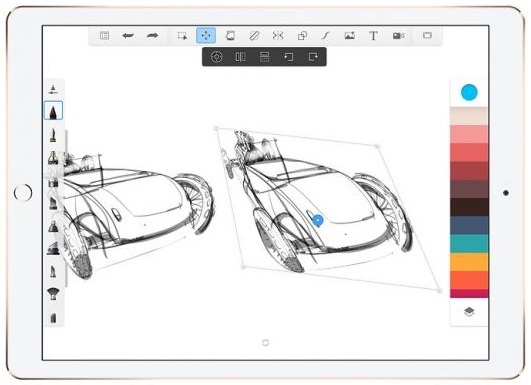 It’s comparable to Adobe Photoshop Sketch in terms of the layout and tools. It even has the ability to share right to Creative Cloud from the app. You can create sketchbook folders to hold your drawings akin to Paper by 53’s style of sketchbook organization. They’ve taken their time making the tools very life-like and the result is impressive. Olivia de Bona coloring book. A slightly hidden feature in the sketchbook library section of the app are free coloring books for you to play with. One is filled with intricate illustrations by acclaimed artist Olivia de Bona and another is the kid-friendly “Carl’s Coloring Book”. Tayasui also has a coloring book app that focuses and just these for those interested. The basic app has a lot to play with for free, but you can also upgrade to the Pro version for only $5.99. That’ll give you unlimited layers, more tools, gradients, color palettes, color mixing, brush size and opacity customization, collapsible UI, screen recording, paper textures, lined and grid paper. Astropad, simply put, is the app that allows you to use your iPad like a graphics tablet for your Mac. This is a great way to go if you want to utilize the same art creation software you are used to on your Mac with the added convenience of the iPad’s sleek and minimal design and the excellent Apple Pencil. There are two flavors of Astropad: Standard and Studio. Both work incredibly fast and smooth. You can use your iPad either via USB or WiFi to your Mac and enjoy working from your couch with battery life that isn’t diminished by using the app. Standard: Standard is pretty much just that, a standard way of broadcasting your Mac’s screen to your iPad. Studio: Promises more customization, frequent updates to the app, priority customer support while also offering gestures and other unique controls Astropad has created specially for their platform. The other major difference that stands out is that while any iPad-compatible stylus can be used with Astropad Standard, Astropad Studio is Apple Pencil only. Honestly I don’t think that’s that big of deal as after using a variety of the styli available, Apple Pencil is the one you’ll want to use for serious creative work anyway. I think Astropad Standard is more than enough for the majority oof users and it’s absolutely worth the money if you want to use the convenience and quality of an iPad Pro and Apple pencil with desktop software. Comic Draw is the only app I’ve seen that focuses specifically on creating comic books from start to finish. It may just be the perfect app for the budding comic book artist. The app itself is divided into three sections: script, artwork, and lettering. The script portion is pretty handy as you can pull from it easily when you get to the lettering step. The art creation portion of the app is relatively simple, honestly it can’t complete with most of the other top tier drawing apps out there in this regard. The lettering portion is really cool since it’s the only app I’ve seen on the iPad that does this. The app is an excellent example of the possibilities of an app focused on creating one type of thing only; comic books in this case. However, updates are few and far between and I haven’t seen any significant improvement of the app after its initial release. I’d love to use it more if it was refined as other apps have been and the art and lettering capabilities improved. The desktop version of Clip Studio has a huge following worldwide. Comic book artists and illustrators have enjoyed it as an alternative to Adobe Photoshop for artwork and the app itself is focused on comic and manga art. When CSP announced that they would be releasing a 1-to-1 translation of the software for iPad, it was met by much fervor by the devoted fanbase. For me, I found the desktop version to be a clunky user interface without much in the way of any design aesthetic and since the iOS version is identical, it brings over all the same issues. That may sound pretentious, but in the age of clean, minimal mobile apps, CSP looks like something that was designed for Windows 95. On top of all that, the makers of Clip Studio Paint have decided to go with a subscription model to use the app. That’s a non-starter for me personally. They won’t even allow you to sync your work to the cloud unless you subscribe and even then it’s the proprietary CSP cloud which I have read numerous complaints about. If you’re 100% invested into Clip Studio, then hey, this probably is awesome for you, but if not, there are cheaper and easier-to-use options out there. I would honestly give it more of a try if they just dumped the subscriptions and went with a one-time purchase price, but what can you do? Memopad is another slick, minimalist drawing app from Tayasui. It’s probably the cleanest and simplest drawing app that’s out there for iOS. If you just want to doodle or you are looking for an app for children to play with, this is a great option. It’s also free or only $1.99 to unlock all the tools so it’s not much of an investment. Inspire Pro was one of the first painting apps that I can remember coming out for iPad. It really gave us a glimpse of the awesome possibilities of the iPad as the hardware and OS improved. The current version of the app still works well, but it may lag behind some of the other art apps out there like Procreate or Artstudio Pro in terms of tools and user interface, but not by much. For an app that has been created by a small group of developers from Ottawa, Canada, there’s a lot to play with here and enjoy. They’re promising a larger update in the future as well, so time will tell what the future of Inspire Pro looks like. ArtRage is one of those apps that most artists haven’t run into even though it was one of the original art apps for the iPad. I really only see people using it in Europe or advertisements in the English magazine ImagineFX. It focuses primarily on recreating the effects of physical materials and textures almost to a fault. The app itself seems like it’s still stuck in the skeuomorphism of early iOS apps. It’s an interesting option and pretty cheap at only $4.99, but it may only appeal to certain artists going for a certain look. ArtRage might also be a good option to give to the kids to play with as it resembles natural media so much. The app is updated frequently, but it doesn’t appear they are going to update the basic look and function of the app anytime soon so it’s hard to recommend to most users. Forge is an interesting app that focuses on brainstorming, ideation, and prototyping. You are able to start a “project” which can include imported images or drawings created within the app. The drawing tools are limited, but they’re designed that way so you focus more on the raw creation of your idea. It’s probably the closest thing I’ve seen to a whiteboard in app form. You can touch, move, and reorder images all around your project space like they were post-it notes on the wall. It’s pretty impressive actually. 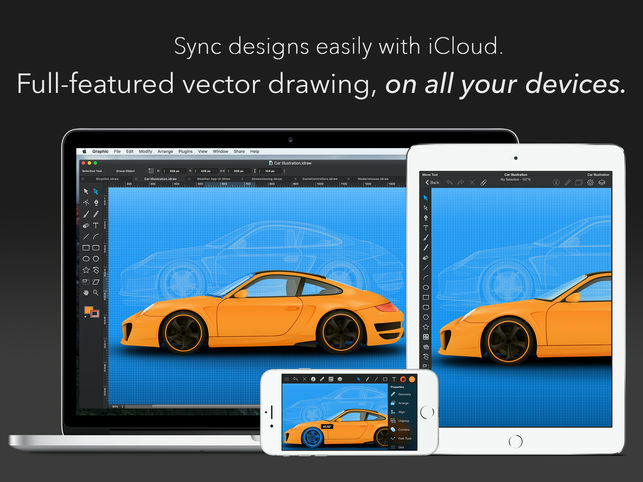 For cloud syncing you can link with Dropbox or Creative Cloud. For a purely artist use, it doesn’t make much sense to use it, but for creative teams, it could be pretty amazing. Adobe Photoshop Sketch…what a ridiculous name. It’s not Photoshop, and it’s sketching capabilities aren’t that impressive. The main selling point here is it’s a way to quickly get some ideas down and then have those ideas accessible to your suite of Creative Cloud apps, providing you’re a subscriber. Without being invested into Creative Cloud, there isn’t much reason to use it compared to all the other great options. An app designed specifically with architects in mind. It’s an impressive app in the vein of Concepts, but unless you’re an interior designer or an architect, it’s nothing that you’d really need. It also uses a subscription model for unlimited access to all the tools which is why I couldn’t recommend it. You guys are killing me with these subscriptions. Knock it off.